Realistically, it's not possible for me to mention every book I read for the Cybils, no matter how much I'd like to. And maybe I wouldn't like to; I'd rather spend the time reading and considering books, and preparing to thumbwrestle it out with the other first round judges when it comes time to turn our individual shortlists into a representative group shortlist. Before we get there, I want to read everything I've been offered, at least in part. And blah blah blah. I can't fit in full reviews, sadly, but here are a few books I've read recently. 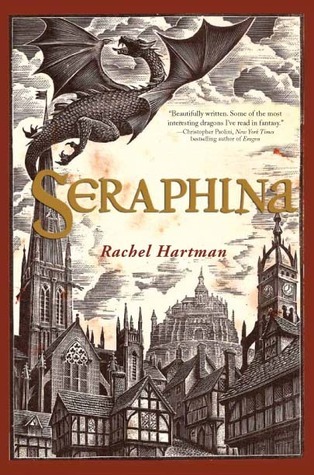 Seraphina by Rachel Hartman (Random House - Books for Young Readers) has been all over the place, but I hadn't read it, and I can see why so many readers liked it. It's set in a fantasy world that draws from various time periods, and you can tell by the cover that there are dragons. There is also music; generally, as a (retired) musician, I can't stand music themes in fantasy, but this is well done. What is perhaps the most well done are themes of being mixed, of being other, of being outside of behavioral norms, of being smart, of elbowing one's way into a world where one is not accepted, of breaking all of society's rules to follow the rule of love. This turns out to be the first in a series; I'm curious how the themes will play out in future installments. 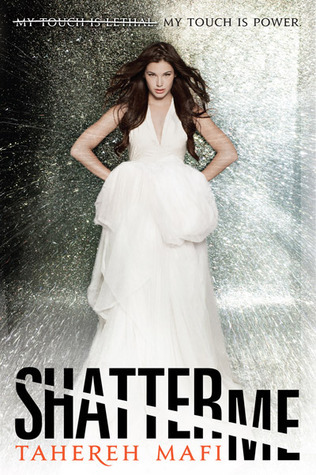 Shatter Me by Tahereh Mafi (Harper) is, sure, a dystopia. Juliette lives in a world that's been battered and misshapen environmentally, and a mysterious military force is in charge. There are soldiers, mysterious factions, and narrow escapes. But none of these hooked me; instead, I found the writing style compelling. Juliette is dangerous. She's a weapon. (And she's a weapon in a way that I think fans of Graceling might like.) She's been in jail, and she's lost her mind. Her thought processes and a use of strikethrough to indicate what she's suppressing, changing her mind about, kept me turning pages until the end. This is the first book in a series. 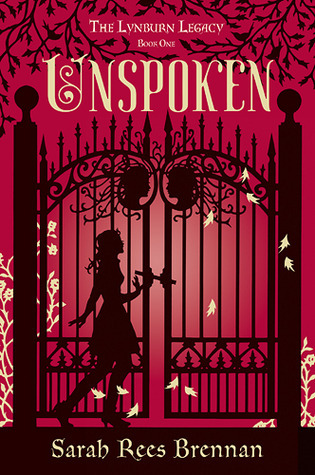 Unspoken by Sarah Rees Brennan (Random House - Books for Young Readers) is exactly what I've been hoping for from this author. Kami lives in Sorry-in-the-Vale, and one day, her imaginary friend, the one who she's always talking to in her head, shows up. Kami is tenacious and funny, and not willing to simply stand by while people get murdered. There's a well-rounded supporting cast and a sense of modern-day Nancy Drew about the whole thing, and Sarah balances the humor with the gothic themes--not an easy task. P.S. Even though Barnes and Noble doesn't seem to like it, I think that cover is awesome. Really, truly awesome. 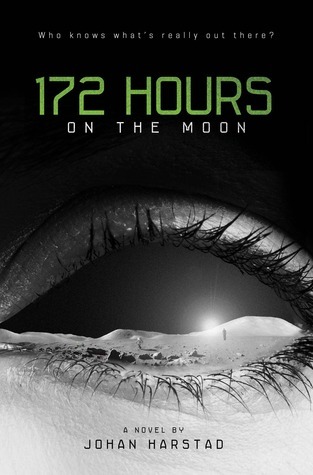 172 Hours on the Moon by Johann Harstad, trans. Tara F. Chace (Little, Brown - Books for Young Readers; previously published by ATOM), is horror...on the moon! NASA has some secrets to cover up, and it's time to get back into the space race. What better distraction than a lottery where three teenagers--here, one from France, one from Japan, and one from Norway--are selected to be astronauts? They'll train! They'll do press junkets! They'll cover up the previously unadvertised moonbase! Don't get too attached, though. This looks like science fiction, but it's actually horror. 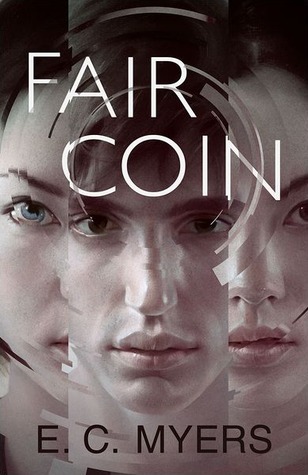 In Fair Coin by E.C. Myers (Prometheus - Pyr) Ephraim's mom thinks he's dead. They found his body. They found his wallet with his library card inside. And when he retrieves the wallet, there's a coin in it. Turns out, that coin grants wishes. Wonderful wishes, like "I wish my mom wasn't a horrible parent" and "I wish that girl would like me." Only, with each wish, the world has to bend to make it happen. There are unexpected consequences, and before long, Ephraim has to decide whether some things are worth having. 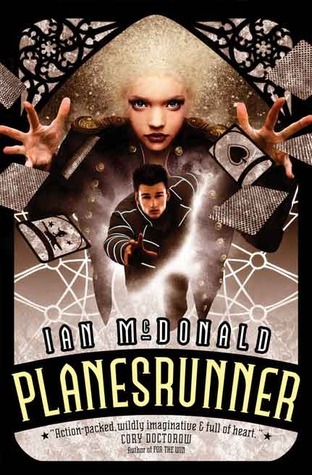 Everett Singh sees his father get kidnapped in Planesrunner by Ian McDonald (Prometheus - Pyr). His mother doesn't quite believe it. The police cover it up. And pretty soon, smart, athletic Everett receives a file, one that opens up to become a beautiful computer program. And not long after, his flat is ransacked, he's being followed, and everything is going wrong. His father discovered something that maybe he shouldn't, something others would like to have, and then Everett is tracking down his father, not just on the streets of London, not just across international boundaries, and not just off this planet, but across universes. Sadly, Blogger won't allow for all the tags I'd like to use. These books are nominated in the YA SF/F category for the 2012 Cybils. I reviewed a copy that I owned for Seraphina and Unspoken, and the rest were provided by their publishers, with no explicit or implied strings. 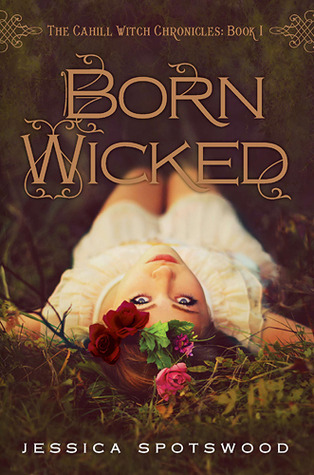 When I try to describe Born Wicked by Jessica Spotswood (Penguin - Putnam Juvenile), I keep saying not quite. Not quite the suppressive teenage marriage/fertility fantasy that's been plaguing the shelves. Not quite the average love triangle. Not quite. It's about 1900, and the Brotherhood--an organization that one is expected to respect, if not join, if you're male--keeps everyone safe, especially the women. They run the schools and the church. They make sure you get married or join the Sisterhood as soon as you're old enough. And they have...other duties. Cate and her sisters, Maura and Tess, have managed to stay out of the way of the Brotherhood, mostly. They rattle around in a big old house, emptier since their mother died. When their father goes away and leaves them with a governess, it becomes much harder to hide their terrible, criminal secret: the three sisters are witches. Cate must marry, soon, or go away to join the Sisterhood, but that will split the sisters up, and Cate's not sure that her sisters will be safe without her; a hint or a rumor could have them sent to an institution or a prison ship. It seems like salvation has arrived in the form of an old friend who's loved Cate for years--but her heart is going in a different direction. Then she discovers that she and her sisters might be part of a prophecy, and that there are many, many witches, some who would use the girls for their own ends. How much will Cate--how much can Cate--sacrifice, and what if all of her options leave someone she cares about heartbroken? I really enjoyed Born Wicked. I imagine that some readers will see it as particularly feminist, and I don't think that's bad; Cate learns that she most wants to be the one in charge of herself, and that such a situation is good for all people. I just took a quick look around at some other reviews and see that some readers didn't like that aspect so much, and I find that interesting, not to mention a refreshing change from bleak futures where we've reverted to very, very traditional roles with no hope for change. This book is nominated in the YA SF/F category for the 2012 Cybils. I reviewed a copy that I owned. So, I thought this book was awesome. In Adaptation by Malinda Lo (Little, Brown Books for Young Readers), Reese and David are on the way back from a disastrous debate competition, and it turns out that they're not getting out at the airport. No one is: a series of bird strikes has crashed dozens of airplanes, and everyone is grounded. They hit the road with their debate coach, planning to road trip from Phoenix back to San Francisco, but before they get home, terrible, frightening things start to happen, including a car crash for Reese and David. They wake up in the hospital--the kind of hospital that makes you sign a non-disclosure agreement before you leave. Why? Routine, of course, until you start to feel like your body is not your own and men in black suits show up at your door. I really liked Reese. She's smart and analytical, and she's self-sufficient. She's discovering some things about her sexuality, and--in contrast to a fair number of other books I've read lately--there's no pressure for her to pick out a permanent label, like, today. I liked David, too; he's just not in quite as much of the book. If Huntress and Ash are watercolors, the style in Adaptation is all sharp edges and overexposed photos. Malinda Lo's journalism background is put to good use here in a handful of articles and reports that feel like, well, an accurate portrayal of uncertain and opportunistic media. 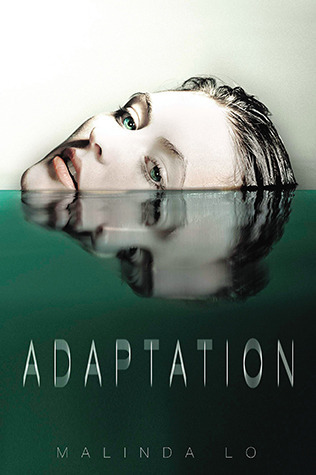 Adaptation gets recommended as "for X-Files fans." I'm not necessarily an X-Files fan, but I definitely enjoyed Adaptation for its otherworldly science, the government conspiracies, and for how, midway through, it starts being hard to figure out whom to trust. Annoyance: I can't go straight on to the sequel. I may be one of the last people--well, among fantasy fans, at least--to read Bitterblue by Kristin Cashore (Penguin - Dial). It had been lingering on my shelf since this spring, waiting for me to "have time" to read it uninterrupted. And then, before I knew it, it was Cybils season, and I was working my way down an alphabetical list of 209 books, and I was reading it right now. Bitterblue is set in the same world as Graceling and Fire, and while one need not have read either in order to enjoy Bitterblue, I think those will help ground readers through the beginning of the story. Bitterblue, a young queen, is overwhelmed with running the kingdom of Monsea, and she's not getting a lot of help. Instead, her advisors pile on paperwork and discourage her from leaving the castle. Maybe that's for the best; Bitterblue's father, the late King Leck, had powers that he used for evil on many of his subjects. The problem is that the new administration, in forgetting, is ignoring--ignoring the great wrongs of the past, and not truly able to make a future. That's the part where having read the linked books comes in: in the beginning, it's nice to know a little more than Bitterblue does, since she is so muddled, and later on, when the reader and Bitterblue catch up to one another, it's a bonus to understand references to the linked books. Sheltered Bitterblue is curious, however, and eventually makes her way out of the castle to hear stories. This is one of several lovely literacy themes throughout. The people of Monsea keep their stories alive through the telling, and the stories live on their own, shifting and changing with the tellers. There are themes that are more textual; Bitterblue constructs herself, in a sense, through what she reads. And, ultimately, forms of writing are very important to the story. There is romance, and adventure, and fighting, which one probably expects from Kristin Cashore, and Bitterblue has an especially complicated story full of puzzles, something new for this book. It's fiendishly plotted, and it might take more than one read to find and appreciate all of the hidden clues. 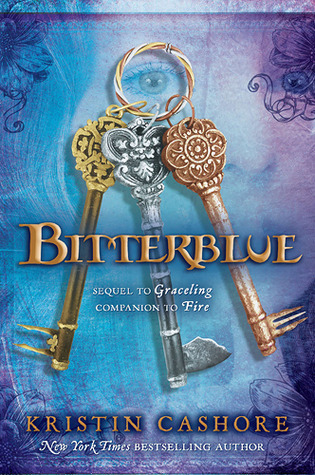 Bitterblue is a fitting culmination of the Graceling series. 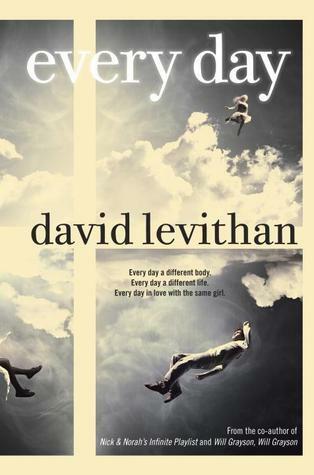 Every Day by David Levithan (Random House - Knopf) is one of those books that might confuse genre readers. To me--to someone who's read old, classic sci-fi in periodicals on newsprint--it feels like it belongs. But since it also feels contemporary, in that way that can't quite be put into words, it's a great read for those who refuse to read one or the other. In the middle of the night, the jump happens. Think Quantum Leap. In the morning, every morning, A is in a new body, trying to get by with a new family, attending a new school, accessing a new person's memories in order to blend in. A knows better than to get too attached, but one day, there's Rhiannon, and she makes A want to do whatever it takes to visit her, over and over, no matter the risk to the body A is in. The problem is, while A sees Rhiannon the same way each day, Rhiannon doesn't see A the same. Body or soul? Two interesting bits for me: first, perhaps because of the first body A is in, I felt that I was hearing a male narrator the whole time. That's not quite A as a character--A isn't gendered. The second interesting bit was a B plot involving a boy that A jumped into and who tracks A down. Even though I love ambiguous, brave endings, and Every Day has an ambiguous, brave ending, I wished for a little more clarity in the B plot at the end of the book. Overall, though, the questions of body and attraction give the book enough of a hook in for fantasy/SF fans and those readers who identify otherwise, and I suspect it would spark a lot of intense discussion in book groups. I haven't stopped thinking about Every Day since I finished it.